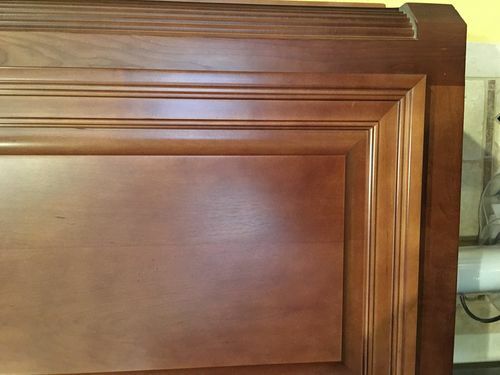 Hi Everyone, I have these cabinets in my kitchen and need help with how to replicate the bead patterns on the door rail and stile. 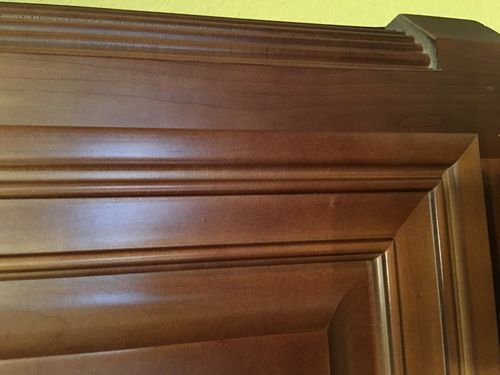 I usually build raised panel doors with a raised panel bit set but haven’t seen any that produce this type of profile. How is the outside bead profile made? Is it only possible building the doors with the mitered corners as shown? Any tips or ideas on how to best replicate this would be appreciated! Thank you. The frames may have been cut with a moulding machine so if you don’t have one you might find a shop that does and is willing to make them. If I had to do it myself I would probably use a build up method with at least two different pieces of wood so I could cut part of the pattern on each piece and glue them together. Also I have had success in the past using a shaper blade on my table saw. The three wing shaper blades can be ground to what every shape you need and in this case you may need to make two or three passes with different cutters to get the final results. It would involve having a piece of wood wider than the final product to support the narrow part during the shaping process (you are cutting on the underside of the wood) and then cutting it off. There are shapers that have only one cutter which would eliminate the need to get three ground to the identical shape but they are slow and the cuts can be rougher.